Former Balboa Island landmark restaurant resurrected as a romantic fine dining spot at the OC Pavilion. : Named after a former Balboa Island landmark, Ambrosia occupies the second floor of the state-of-the-art concert and theater space inside downtown Santa Ana's OC Pavilion. A romantic ambience is created from flickering candle light, cozy black banquettes, luxurious palm trees, red roses at each table in a vase and crisp white linen tablecloths. A plush red velvet curtain separates patrons from the small stage, where some of OC's best jazz acts play nightly. Executive chef Ryan Carson heads Ambrosia's French California cuisine. Start with a strong house-made cocktail or order up a bold red wine with such French classics as escargots en vol-au-vent or frisée and lardons salad. The entrée list is short, offering items such as a surf (Maine lobster claw) and turf (culotte steak with bone marrow custard) combo, jidori chicken roulade, Tasmanian trout and the restaurant’s signature Châteaubriand for two. 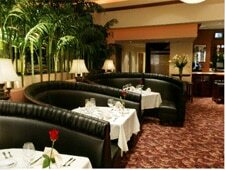 Chef Carson also offers a reasonably priced, five-course tasting menu. Be sure to order the dark chocolate mousse cake with oddly tasty heirloom beet purée, Valencia orange essence and marshmallow foam. The wine list here is vast and includes thousands of domestic and international varietals, as well as a fine selection of lagers and ales.